In a bid to bring back order to the mining industry the South African government and mining stakeholders have signed a framework to help secure peace and stability in the sector, according to a government statement. “We can’t have a sector in turmoil,” said Susan Shabangu, mineral resources minister. Representatives from the Chamber of Mines, National Union of Mineworkers, National Union of Metalworkers of South Africa, UASA, Solidarity and Anglo Platinum joined the minister for the meet. “A task team, constituted by all role-players, agreed to work on the document, the framework for peace and stability,” Shabangu said. “We need to come on board, call all the stakeholders and say ‘how do we move forward?’” stated the minister. The move by the government comes in the wake of members of two opposing trade unions attacking each other at the Anglo-American Platinum (Amplats) mining operation in Rustenburg, outside Johannesburg on Monday. 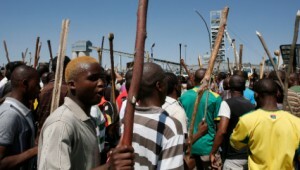 “On Monday, we saw the tension [at] Amplats. We thought as government, we couldn’t watch and wait.” the minister said. Thirteen people were hurt in the latest clashes. A string of wildcat strikes have put pressure on many mining companies operating in South Africa, the continent’s largest economy. The government has already ruled out nationalisation of mines as a policy option. Notable in their absence was the Association for Mineworkers and Construction Union (Amcu), who have not yet agreed to the document. “Sadly, Amcu is not here. We’ve never left them behind. We’ve been trying to get hold of them,” said Shabangu. The minister said government – represented by the departments of mineral resources and labour – as well as stakeholders met to discuss a way forward and to prevent a repeat of the events that unfolded in the sector last year. “What happened need not happen again,” she said in reference to the Marikana tragedy last year. Shabangu stressed the importance of creating an environment where workers were able to do their work. The signing of the agreement would lead to the start of a healing process among all parties, she added. “We are committed to normalising the mining sector. We don’t want to go back to last year. Past experiences are lessons of ensuring the future won’t be the same,” said Shabangu. The Chamber of Mines said it appreciated the collaboration between role players. NUMSA also agreed to the document, saying no industry could prosper if there was instability. Last month, Anglo American Platinum, the world’s top platinum producer, announced plans to stop services at two mines, sell an unprofitable one and put 14,000 jobs at risk.